Stucco is a building material that dates back to the Greek and Roman civilizations. Ancient peoples used stucco as the base for painting murals inside their homes. Today it is used as a relatively inexpensive, fireproof, durable exterior finish for houses. Stucco is a popular finish for home exteriors, especially in the Southwest. Stucco is a building material that dates back to the Greek and Roman civilizations. Ancient peoples used stucco as the base for painting murals inside their homes. Today it is used as a relatively inexpensive, fireproof, durable exterior finish for houses. Originally, stucco was made of water, lime, and other aggregates. Now Portland cement is usually incorporated in the recipe and synthetic formulations are available as well. To ensure that your stucco will stay where you put it without slumping, flaking, or cracking, install the correct underpinning first. Cover the framed wall or walls with plywood, cutting it as necessary with the circular saw and nailing it to the studs, window casings and door casings with a hammer. The plywood sheathing provides a firm base on which to apply the stucco. Staple builder's paper to the plywood sheathing with a staple gun. Cover the entire surface, then nail 1-by-2-inch lathing strips horizontally over the paper, spacing the strips at intervals of about 2 inches. 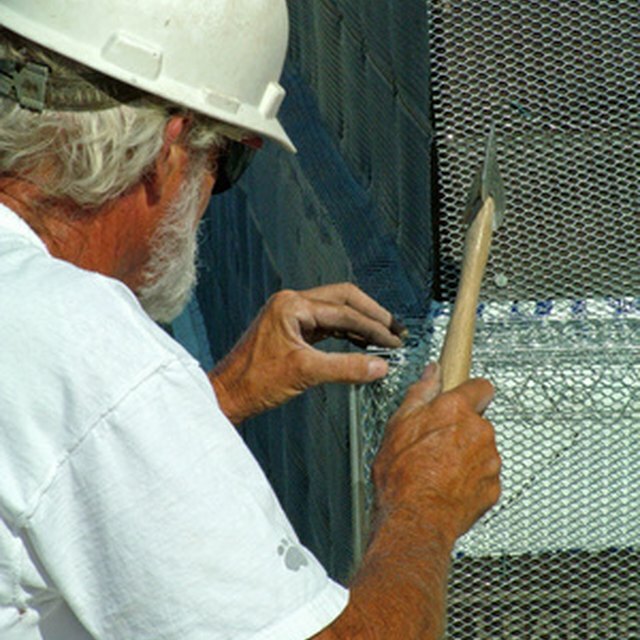 Attach chicken wire over the lathing strips, using a staple gun. Cut the chicken wire as necessary with wire cutters. Cover the entire surface you want to stucco. This four-layer foundation keeps the stucco from slumping down the wall when it is wet and provides stability and strength after it is dry. Trowel the stucco over the chicken wire, forcing it into the spaces between the lathing strips. You do not need to completely hide the chicken wire at this point. Finish the first layer for the entire wall and let it dry. Put on two more layers of stucco, covering the chicken wire completely when you apply the second layer. Let that layer dry before applying the final layer, which you may want to texture with a trowel or a specialized stucco texturing tool.